Home » Rocks » What is Rock Art? Petroglyphs on sandstone at Newspaper Rock in southwestern Utah. Image copyright iStockphoto / Jeremy Edwards. Petroglyph: This petroglyph is thought to have been carved by Native Americans into the wall of Buckskin Gulch in southern Utah, USA. Image copyright iStockphoto / amygdala_imagery. Long before writing was developed, people recorded events, ideas, plans, and feelings by marking them on a rock. Sometimes they carved into the stone. Sometimes they scratched off a surface coating. Sometimes they painted on the rocks. The method that they used was typically determined by the availability of a "paint," the hardness of the rocks, and the availability of tools that could be used to produce their message. All of these markings are referred to as "Rock Art." 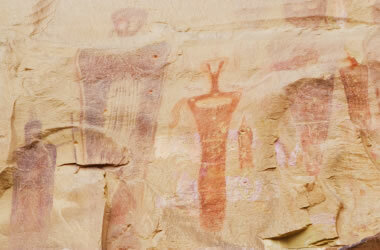 People worldwide have been producing rock art for thousands of years. Some of their messages, produced thousands of years ago, can still be seen today. The oldest are usually found in rock shelters and caves where they are protected from the elements. However, in arid climates some examples of rock art have persisted for ten to fifteen thousand years, depending upon how the art was produced, the direction that it faces, and the type of rock used as a "canvas." There are two basic types of rock art: petroglyphs and pictographs. A brief description of each is given below. Petroglyphs: A large number of petroglyphs on a rock in Petrified Forest National Park, Arizona, USA. Image copyright iStockphoto / Tom Marvin. A petroglyph is an image that is carved into a rock. This "carving" can produce a visible indentation in the rock, or it can simply be the scratching away of a weathered surface to reveal unweathered material of a different color below. 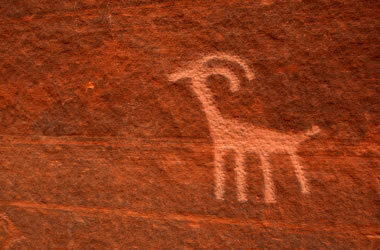 The bighorn sheep carved into an orange-brown sandstone, shown near the top of this page, is a petroglyph. The artist scratched the surface of the rock with a tool. This work produced an indentation in the rock and also exposed an unweathered material of lighter color below. The petroglyphs on "Newspaper Rock," shown at the top of this page, were made by scraping away the thin black coating known as "desert varnish" from the surface of the rock. Both types of petroglyphs are common, but the ones carved into the rock have a better chance to persist through time. Pictographs: This pictograph is believed to represent people of the Fremont Culture who used to live in what is now south-central Utah. Image copyright iStockphoto / Andrea Gingerich. A pictograph is a drawing or painting that is created on a rock. Because they are merely a surface coating, pictographs tend to be less durable than petroglyphs. The ones that survive are most often found in caves, rock shelters, and areas with dry climates. A variety of pigments have been used to make pictographs. Examples of these pigments include pieces of charcoal from a campfire; blood from hunted or sacrificed animals; and rock or mineral materials such as chalk, limonite, or hematite. Vandalism? An example of recent "rock art" that might be "vandalism" if it was not created by the property owner. Image copyright iStockphoto / Richard Clark. 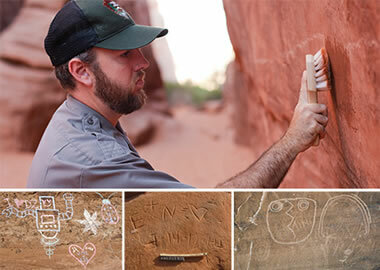 Removing graffiti: A National Park Service staff member working to remove graffiti at Arches National Park. The rocks in national parks are expected to be kept in their natural condition. Painting, carving, or marking on the rocks in any way is considered vandalism. Graffiti is a serious problem at some parks. Learn more. 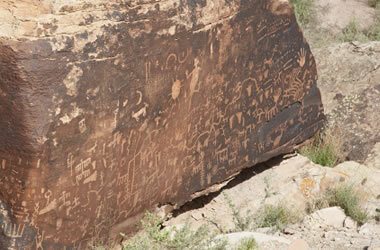 Ancient petroglyphs do not have "signatures" because they were produced before written words were invented. So, they cannot be attributed to a specific person. However, petroglyphs can sometimes be attributed to a specific group of people who inhabited or passed through the area where the petroglyphs occur. Shown on this page is a photo of a rock with a large number of petroglyphs in Petrified Forest National Park, Arizona, USA. The rock is in a location where it can be easily seen by anyone who passes by. The images may have been made at different times because they exhibit different degrees of weathering. Some may have been made by some of the early people to inhabit this area, others could have been made by people who passed through hundreds of years later, or they could have been made recently. Rock art is very difficult to date. However, some experts can estimate how quickly paints fade or how much time has passed since a carving was made into a rock. These methods can be used to place an approximate date on a pictograph or a petroglyph. These tests are infrequently used because they require the work of an expert who has access to specialized equipment and methods of testing. Graffiti vandals deface history Wookey Hole cave: YouTube video by SWNS TV, published July 29, 2013. Another Street Artist Allegedly Vandalized A National Park And Posted About It On Instagram: Article on The Huffington Post website, March 3, 2015. Rock art allegedly vandalized by college geology students: Article on KSL.com, September 3, 2015. Celebrity under investigation for allegedly defacing Sedona Red Rocks: Article on CNN.com, February 17, 2016. 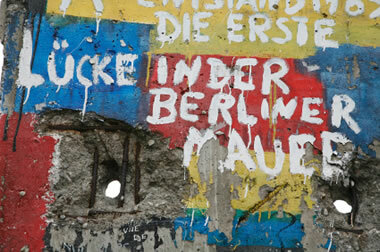 Graffiti: This graffiti, painted on the Berlin Wall, commemorates the first holes broken through the barrier. Image copyright iStockphoto / CrazyD. Ancient carvings and paintings on rocks are searched for, considered to be historical treasures, and carefully protected. Modern carvings and paintings on rocks are viewed in an entirely different light. If they are produced on government land or private property without permission, they will be considered an act of vandalism. 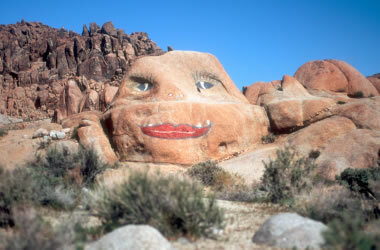 Once defaced, the rocks can be difficult or impossible to restore to their natural condition. So, if you want to produce some "rock art," be sure you own the property where the rock is located and be sure that the property is not subject to regulations that would prohibit changing the appearance of the rocks! Graffiti: In some cities graffiti artists are so active that new images are painted over old almost as soon as the paint is dry. This heavily painted wall is in an alley off Queen Street in Toronto, Canada. Image copyright iStockphoto / Maytals. Today, many people still have a desire to paint on a wall for communication and personal expression. They produce an art form known as "graffiti" on buildings, walls, railroad cars, trucks, and any flat surface they can utilize. Although many types of graffiti are very similar to "rock art" in format and style, producing it is usually defacement of property and vandalism. Even though some graffiti artists have become famous for their work, they do not enjoy the same freedom of expression that was enjoyed by ancient artists! Producing graffiti on public or private property is a crime. Some cities spend millions of dollars per year to remove graffiti. If you want to become a graffiti artist, use your own property as a "canvas" or get permission from a property owner who will enjoy your work. Before you start painting, find out if the format of your work and the content of your message are allowed to be displayed where the building is located.